The Nguyen Emperor Khai Dinh's Royal Tomb is unique among the royal tombs in Hue, Vietnam. 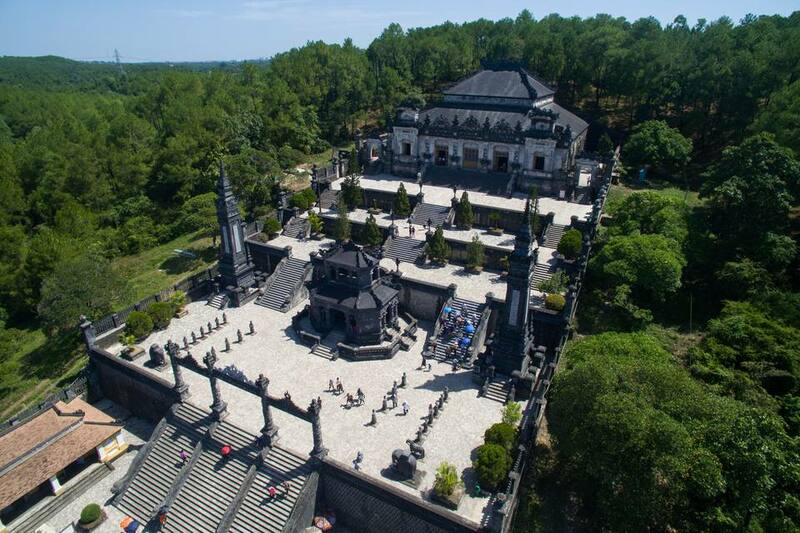 Where other royal tombs are expansive and invite respectful reflection, Khai Dinh built his final resting place to be monumental in style and bombastic in execution. Plus, if the local tour guides are to be believed, Khai Dinh's tomb was purposefully designed to be difficult to visit - the tomb was built on the side of a mountain, and its inner sanctum is 127 steps up from street level, a fact that must have grated on the court officials who were required on pain of their lives to pay their respects to the late emperor. Getting to Khai Dinh's tomb: the site is six miles from Hue, and is served by package tours, xe om, and cyclo drivers from the town center. For more on each method and their prices, consult our article on How to Visit Hue Royal Tombs. See Khai Dinh Tomb's location on Google Maps. Operating Hours and Admission Fees: Admission to Khai Dinh's Royal Tomb costs VND 55,000, to be paid at the gate. The Tomb is open from 8:00am to 6:00pm. Must Haves: parasol, sunglasses, and a bottle of water in the sunny season during April-September, and an umbrella and raincoat/jacket during the rainy months of October-March. (See our Weather in Vietnam article to find out more.) Comfortable shoes, plus calves of steel - those 127 steps won't climb themselves. Khai Dinh's royal tomb is definitely not wheelchair-friendly, and the government hasn't seen fit to add an elevator to the site, so if you're mobility-challenged, better give this one a pass. From the street facing Khai Dinh’s Royal Tomb, visitors must climb up a series of steps to reach the wrought-iron gate that limits access to the tomb. At street level, the tomb looks gray and imposing – the Emperor chose to build his tomb out of modern materials like concrete and wrought iron. The tomb is also wired for electricity, a first in Hue tomb design. Despite the Eastern design sensibility, a large dollop of Western influence can be seen in the tomb’s details. The Emperor visited the Marseilles Colonial Exhibition in France in 1922, which may have accounted for the significant European influence on the tomb’s design. The tomb began construction in 1920 and took eleven years to complete, and was still unfinished when the Emperor Khai Dinh died of tuberculosis in 1925. His son, the last Emperor of Vietnam Bao Dai, finally completed the tomb in 1931. After passing the gate, visitors enter a courtyard lined with the traditional left and right mandarins’ buildings constructed from reinforced concrete. Visitors must climb another 37 steps to reach the forecourt level preceding the mausoleum. Even at this point, veteran tomb-visitors might note that Khai Dinh’s royal tomb is much smaller than his predecessors’ (the whole lot is about 1.3 acres in area). To make up for the size mismatch, the tomb’s designers must have seen fit to cram in much more elaborate detail in the space they had. The steps leading up to the forecourt are “guarded” by two dragons, forming a sinuous set of banisters. Two pillars flank the forecourt, also called the imperial audience court, which in turn directly precedes the octagonal stele pavilion that bears the imperial hagiography written by Khai Dinh’s successor. Like the other royal tombs in Hue, Khai Dinh’s royal tomb also has an honor guard of stone bodyguards, mandarins, elephants, and horses. This honor guard, unlike the rest of the royal tomb, is carved out of stone, and occupy two rows on each side of the forecourt. In the middle of the forecourt stands the octagonal stele pavilion commemorating Khai Dinh’s life and accomplishments. Like the rest of the tomb, the pavilion is made of reinforced concrete. In real life, Emperor Khai Dinh came to the throne at a difficult time – in 1916, the French were rulers in all but name, and had exiled the previous two emperors for their refusal to cooperate. Khai Dinh’s reign, from 1916 to 1925, marked a period of subservience to the French colonial masters. The tomb itself was a point of contention; Khai Dinh squeezed his peasantry hard to come up with the funds to finance the construction of his tomb. Khai Dinh’s unpopularity with his people may have influenced his decision to place his tomb on the slope of Chau Chu Mountain in the outskirts of Hue – a story that local tour guides don’t try very hard to dissuade. Another flight of stairs takes you to the apex of the entire tomb complex, the elaborate Thien Dinh Palace, which may be entered on the right side entrance (the front entrance is locked). The palace interior is organized into three parallel rows of halls. Left and right rows were for the use of the tomb caretakers. The middle row housed the Emperor’s relics and the reserved space for the nobility to worship the emperor’s memory. Thien Dinh palace presents the greatest departure from the gray grimness of the rest of the tomb. The exterior is decorated in a flowery show of glass and porcelain that can best be described as “baroque”; the interior is no less gaudy. The ceiling bears nine painted dragons flying amidst the clouds. The walls are decorated with bits of porcelain and glass. The caretakers have surrendered the left and right rows to an exhibit of the Emperor Khai Dinh’s personal effects, including a gold chair, photographs of the Emperor’s life and times, and this rather martial-looking statue of the Emperor standing like a conqueror. This is a closeup of the ceramic mosaic that makes up the walls of the center row within the Thien Dinh Palace at the top of the tomb. The walls and partitions of the palace’s left and right rows are made of undecorated imitation stone, but the walls in the middle row – housing the crypt and the places for the Emperor’s “cult” – are a riot of color and texture, of the type that can be found nowhere else in Vietnam. The mosaics are the work of Vietnamese artisans, who created a lush interior for the palace that many experts have called a work of “Vietnamese neo-classicism”. Using broken porcelain vases and bits of glass, the artisans created densely-populated inlaid tile wall designs that proliferate throughout the palace walls. The center rear of the palace reveals the piece de resistance: a life-size bronze statue of the enthroned Emperor Khai Dinh, sitting under a concrete canopy decorated with a ceramic-and-glass mosaic. The statue was cast in France in 1920; the canopy weighs over a ton, belying its lacy appearance. The Emperor’s successor Bao Dai completed the tomb in 1931, six years after Khai Dinh’s death. Not long after, World War II and the Cold War would turn the Nguyen Dynasty out of Hue; Bao Dai became the last ruling Nguyen emperor, for a time becoming a puppet head of state for the Japanese, then the French, then finally the South Vietnamese government based in Saigon. The end of the Nguyen dynasty also ensured that Khai Dinh’s would be the last royal tomb constructed in Hue.